Esenwein & Johnson the second most prolific architectural practice in Buffalo after Green & Wicks, produced over 1000 designs, from mantels to multi‐building complexes. Amongst eight prominent architects of the Pan American Exposition, their most infamous design was the short‐lived Temple of Music where President McKinley was shot. 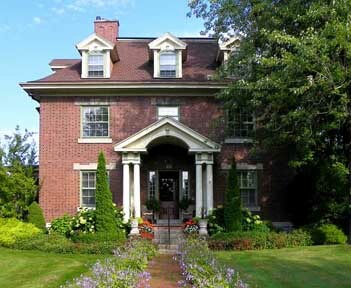 Walter R Trible commissioned Esenwein & Johnson to design this three bay Colonial Revival which was built in 1904/05 at a total cost of $18,000 [$191,595. in 2010]. Set amidst charming grounds, it has a Flemish Bond brick pattern (alternating glazed headers and stretchers in every course) and a front porch with Doric columns and rich classical detail. The circular patterned tiled entry vestibule leads to a grand entry hall with a magnificent colonial staircase. Beautifully maintained, the kitchen was replaced in 2005. Esenwein & Johnson also designed both neighboring houses. | ...Home Page ...| ..Buffalo Architecture Index...| ..Buffalo History Index...| .. ..Related Pages ..|.. E-Mail ...| ..